Soil from your garden is great for the garden not so good for seed starting. 2. Purchased bales on potting soil. I don’t use the more expensive seed starting mix it’s not worth it. Cost wise it’s cheaper to make your own. Time wise it more efficient to buy a bale of potting soil. A bale is compressed into….well, a bale. Fill trays and pack firmly. Always water with warm water it absorbs easily and stops water run off. Seeds do not require any type of nutrient to germinate. They need only warmth and in some cases light and moisture. At 2 weeks after germination I give them a sprinkling of worm castings or a small drink of compost tea. Plants require 14 to 16 hours of daylight after germination. If the plants have a high light requirement, I keep the bulbs 4” away from the plants. If you work during the day, cover your plants loosely with drycleaning plastic, plastic wrap or one layer of wet newspaper to keep the seeds moist. 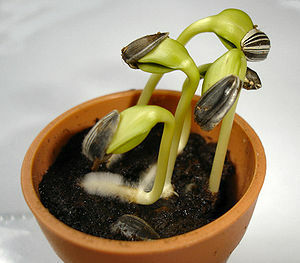 If the seeds are in the germination cycle and they dry out the embryo will die. Seeds need 50% their weight in water to germinate. Water logged soil equals no oxygen which equals an anaerobic environment that kills seeds. I really like to use a single layer of wet newsprint. Once the seeds have broken through the surface remove the plastic or newspaper to prevent damping off. Once to seeds break the soil drop the temperature 10C. Too warm they become leggy which makes for weak plants. How deep do I plant them? Small seeds: Plant very shallow or sprinkle on surface and spray with water. Large seeds: Plant deeper. Plant the length again of the length of the seed. Damping off is a mold condition that can weaken and kill seedlings. Sunflower seedlings, note the damping off at the stem. If you see this condition starting, don’t wait to treat. One time dusting with cinnamon or charcoal dust. AIR MOVEMENT is the most important factor in preventing damping off. *** To clean old gardening containers. Use warm water and hydrogen peroxide 2TBSP/ gal water. In nature this happens when seeds move through the digestive system of birds and animals and through freezing. To scarify a seed gently rub it against a piece of sandpaper, just enough to rough the surface and slightly change the color of the skin. Seeds that will need scarification: Large thick skinned seeds like runner beans, anything in the morning glory family. Seed Stratification: naturally: just plant in the ground and allow to go through the freeze thaw cycles naturally. To mimic nature: place seeds in a plastic zip lock bag with moist soil medium and seal. Place in fridge for 2 weeks remove from fridge, check to make sure their is still moisture in the bag. Store in a cool place for a week. Return to fridge for another 2 weeks , remove and keep in sealed baggie for another week in a cool area. This mimics the freeze/thaw cycle. Seeds that need stratification: perennials, tiny seeds like poppies, trees and shrubs. Beans , peas , sweet peas love to be planted with an inoculant! You can purchase inoculant at all garden centers. Almost anything can be used for planting. Egg cartons, milk cartons, plastic salad trays, used take out containers, toilet paper rolls. Newspaper rolls, soil blocks …. The list goes on and on. Make sure they are clean. Start seeds 4 to 12 weeks before last frost. By March 1st I have onions, leeks,petunias and some perennials started. Starting too early the plants tend to get leggy and weak which makes them highly susceptible to damping down. My top 15 starts: Cabbage, Cucumber, leek,onion,peppers,tomatoes, Basil, parsley, sage, rosemary, Marigold,(Dantes), Petunia. Monarda, Wormwood, Rudbeckia. A week or two before planting out start reducing heat available to plants. Give no supplements such as fertilizer ( worm castings). Reduce watering. This is tough love but conditions your plants to survive in harsh conditions. If you have a hoop house, greenhouse or cold frames, they are great for hardening off. They allow you to leave the plants out at night with some protection for the elements. Be sure to check the night time temperatures, and remember it really heats up during the day so allow some ventilation. Choose a day that is cloudy and damp. If you want to get really exact use a Biodynamic planting calendar ( available on the internet) It will give you exact days for root crops and leaf crops to be planted.I love this system and find it does make a difference. Using fingers dig a small hole add a sprinkling of worm castings. Place plant and add light soil with a bit of sand. Do not plant too deep! If you attended my workshop on seed starting, here is the background on seeds. Lengthy, but good to know. It’s a cross between two different plants which creates something new and exciting. The crosses have to be done under controlled conditions, sometimes by hand, which makes F1 hybrid seed more expensive to produce than normal (open-pollinated) seed. This is nearly always reflected in the price. The price hike is often very substantial. The seed companies sometimes hide this very efficiently by pricing the packets only a little higher than the non-hybrids but with a much reduced quantity of seed inside. F1 hybrids don’t come true from seed. If you save seed from your hybrid plants and sow them yourself next year, the results will will be less than pleasing. They will revert to a mixture of feeble and substandard plants which may look nothing like the plant you took them from. To get the same quality as the original seed planted you must purchase new seed. To maximize their potential, F1 hybrids are often reliant on intensive culture based around chemicals. Many seed companies also recommend the very fertilizer the seed was raised on and may be infected with. Without these chemical inputs the plants will give you substandard results. When folks try to go organic and use Fi Hybrid seeds, many times they are disappointed with the results. F1 hybrids are usually very uniform, i.e. all the plants turn out the same. For gardeners there’s more benefit in growing open-pollinated plants which have a healthily diverse gene pool with natural pest and disease resistance, show a few interesting variations from time to time, and from which seed can be saved for free. So are F1 hybrids superior to open-pollinated varieties? That depends … not just on how you grow it but on what it is. If it’s sweetcorn then yes go for an F1, they’re way better. If it’s tomatoes, then F1 hybrids are probably a waste of money. It’s all to do with the way different types of plants reproduce and how they like to shake up their genes. There are two basic types: inbreeders and outbreeders. Inbreeders, which include tomatoes, peas, lettuces and French beans, have enclosed flowers which almost always self-pollinate. No bees needed. The offspring is genetically almost identical to the parents, and they’re quite happy with that arrangement. Outbreeders, on the other hand, chuck their pollen far and wide in the hope of mixing up the gene pool as much as possible. Sweetcorn, carrots, onions, beets and brassicas are all outbreeders. They rely on being pollinated by other plants of the same species. Otherwise within a few generations they start to suffer. Hybrid vigor: If you cross two different varieties of an outbreeding plant, the offspring may well turn out bigger, better and faster-growing than either of the parents. This is exactly what an F1 hybrid is: the term stands for ‘first filial’ generation and refers to a direct cross between two separate varieties. If you then cross the F1 generation with itself you get an F2 generation, and so on. But the hybrid vigor is not passed on. It’s for one generation only. The opposite of hybrid vigor is inbreeding depression. If you cross two outbreeding plants of the same variety, or it self-pollinates, the offspring can turn out weaker and slower-growing than either parent, and it gets worse with each subsequent generation. Hybrid vigor and inbreeding depression only affect outbreeding plants. Inbreeders can inbreed to kingdom come and not show any ill-effects. But by the same token they don’t show any extra vigor when you hybridize them. There’s no special advantage in buying F1 hybrids of these plants. Going beyond the realms of the domestic garden for a moment, there are serious issues with the introduction of hybrid seed in developing countries. What started off as aid has in some cases increased hardship and crop failure among some of the world’s most vulnerable people. Big seed companies donate hybrid seed in vast amounts to community projects, which makes them look ‘ethical’. In most cases this involves replacing the locally grown varieties which have been saved and replanted in these communities for generations. Once they have been given the hybrid seed, farmers are locked into a cycle of buying the pesticides and fertilizers to go with them, which are cripplingly expensive as well as unhealthy. The hybrid seed is not optimized for the local growing conditions and often does badly. Shockingly, many farming communities who have received well-intentioned charitable aid in this way are now worse off than they were before. Open-pollinated plants which have a healthily diverse gene pool with natural pest and disease resistance, show a few interesting variations from time to time, and from which seed can be saved for free. We owe our gratitude to the world farmers, men and women who selected, improved and saved seeds for centuries. For creating a rich and wonderful diversity of food crops, enjoyed, appreciated and valued by all cultures, religions, and nations around the world. We also owe this rich and wonderful diversity to the forces of regeneration, to the tireless efforts of bees, bumblebees, and numerous insects as primary carriers of plant pollens and to the wind for carrying the pollen along. All ensuring the all important pollination and regeneration year after year. For without these there would be no seeds. Open pollination is the general term associated with the natural means by which plants reproduce and exchange characteristics from generation to generation. Plants propagate either as cross-pollinators, self-pollinators, or semi cross/self-pollinators. Attributes of Open Pollinated varieties are usually associated to vegetables. Their seeds breed true to type, which means the offspring from one generation to another will always closely resemble the parent plants and pass on their characteristics. Open pollinated varieties carry wide genetic diversity and contribute to bio-diversity within food crops. They are sensitive to the environment and thereby flexible towards adaptation and tolerant to soil types, cold and warm climates, wet and dry conditions, altitudes, latitudes, salinity, diseases and other factors. OP seeds can be successfully saved by home and professional gardeners. The seeds’ ability to breed true gives rise to a feeling of reliability, continuity, and possibility for the gardener to be in a position to aim and select for something in a plant that is to his/her liking and joy. To be co-creating can become an empowering feeling and can be a true dialogue with mother nature. It is not more than 50 years ago when the world population enjoyed its food coming almost entirely from open pollinated varieties (99.5% OPS vs. hybrid maize/corn, tomato and aubergine which were on the market). However, during the last 45 years open pollinated seeds have disappeared from the seed markets and National Seed Lists at an alarming rate. Why? Were they becoming inferior, or out dated? The fact is, they were being replaced by F1 hybrids. In 2005**, a study from Germany pointed out that in the European seed markets 74% of cauliflower varieties were hybrids, of carrots 80%, of calabrese 85%, of spinach 87%, of tomato 89%, of salad cucumbers 92%. In 2011 these figures will undoubtedly be higher. Clearly, during the last decades our most important open pollinated vegetable species have been turned into F1’s and with the trend increasing. But our food is not about corporate seed control, or engineering food plants to terminate, or disturb the all vital force of renewability of the seeds. Surely it is more about empowering people and to share our skills and knowledge to make sure our freedom and right to seeds is not threatened or blocked. Nature never holds back, but gives in abundance. We can improve on crops and breed to our hearts content but to claim the fruits and successes of our labour in private ownership from freely provided biological material is both a betrayal and tragedy. If plant breeders invested as much time, attention and finance on open pollinated plant breeding as has been invested in developing modern hybrids, results would no doubt be excellent. Excellent Podcast on Seed starting and different types of seed. I really enjoyed the discussion on organic seed selection. Seed companies I use and respect for good quality seed. Seedy Saturday, Calgary This would be my first stop for seeds that are acclimatized to our area. Salt Spring Seeds Great selection of Open pollinated, Heirloom, organic seed. West Coast Seeds They do carry some F1Hybrids, it’s always stated in the description. High Mowing Organic Seeds for 100% certified organic seeds. Make sure to order soon they take awhile. They have some lovely videos to get you started. Richters Although they do not state the status of the seed or growers, I do like their catalogue as a resource and will occasionally order some hard to find native herbal seeds from them. Mostly perennials. Consider the seed, each is a living entity. With a protective outer coat, the seed contains an embryo that will grow into a seedling. It has a supplied store of nutrients along with enzymes that convert to food that is useable and genetic directions for it’s development. They take in oxygen and give off carbon dioxide. When planted, absorb water, activating enzymes that start the sprouting process. Seeds are programmed to grow. I hope we meet again along the road to a better planet!